How Much Does It Cost To Run A Public Relations Or Social Media Campaign Using a Hot Air Balloon? As starting points... budget low to mid six figures for a national tour in its first year with subsequent years in the six figure range. A regional tour might be somewhat less depending upon the number of days on the road and other factors. Local merchants or single day events have a much lower price point still. Much depends upon what you want to do with your balloon program. Hot air balloons, like vehicles, come in many different shapes and sizes and the advice as to which is best suited for your brand will depend upon your public relations, community relations or branding requirements with the project. But, it's more than just the cost of producing a hot air balloon or artwork on a banner balloon. It's about the capability of the team before, during and after every flight and event. 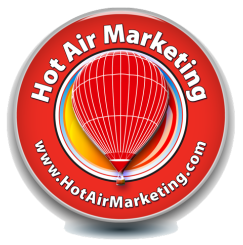 With Hot Air Marketing, your brand is working with seasoned marketing professionals with decades of consumer and key customer engagement. Your brand is working with a an advocate, spokesperson and salesperson, as well as, a professional pilot. Hot air balloon size can vary in size, design and shape. Larger hot air balloons are good for corporate hospitality, for example. Where midsize balloons are best suited to tethering at events, night glows or competition flying while still accommodating the pilot plus passengers. While "special shape" balloons represent a different class of investment, they attract a special class of attention from consumers and the media when well designed to support your brand story and values. Bottom line, virtually any hot air balloon featuring your brand prominently displayed is a 65 foot tall (or taller) billboard that consumers, your customers and prospects will likely want to take photos of and share with those they know. It dramatically increases the likelihood they will want to participate with your brand and generate content about you and for you - that's effective public relations and social media marketing! Where do you want to go with your program? A national traveling hot air balloon campaign can vary widely in terms of investment levels based upon the scope of events and markets you are trying to impact. What are your goals? Branding, customer relations, sales promotions, audience development, social media engagement, support of other event or experiential marketing sponsorships... All of these are worthwhile objectives with your hot air balloon themed advertising, public relations or social media tour. We recommend you start with a phone call or initial interview to brainstorm ideas suited to your business objectives. If you are a public relations professional, public relations agency, brand manager, or social media marketing guru looking for new ways to capture the hearts of your customers, we invite you to complete our confidential inquiry form to talk about your ideas. ​Click the Big Red button now!